With the highest engaging rate among all other means of advertising, SMS has become an easiest way of promoting your business. has become an easiest way of promoting your business. But to make most out of it, it is very important to use it in right way. There are many points of considerations which, if taken care of can develop a successful SMS campaign. After the in-depth analysis of various successful SMS campaigns it has been concluded that messages which have clear, direct message within short and simple words leave more impact on the mind of customers. So, keep the message length short with a crystal clear call to action. Being an informal channel of communication you can always include some fun and interesting elements in your SMS. Quirky memes, shortened text speaks like “ur”, “pls” etc and interactive content can extended the value of your message. Another very important element to take care of is the right time of sending the message. And this could be done best by understanding the daily habits of your customers. Try to send your messages in standard business time and avoid Mondays as they can show low response rates. Never try to send messages forcefully to your users. It is better to take permission first rather than spamming the people’s phone unnecessary. Also, try to keep an option of “opt-out” for those who further don’t want to receive your messages. Like all other mediums you should also keep a track of your SMS campaigns too. Are your messages being open and read? How many people are opting out from your this campaign? Are users feeling engaged with this SMS campaign? These kinds of small tracks can help you improve your next campaigns in better way. 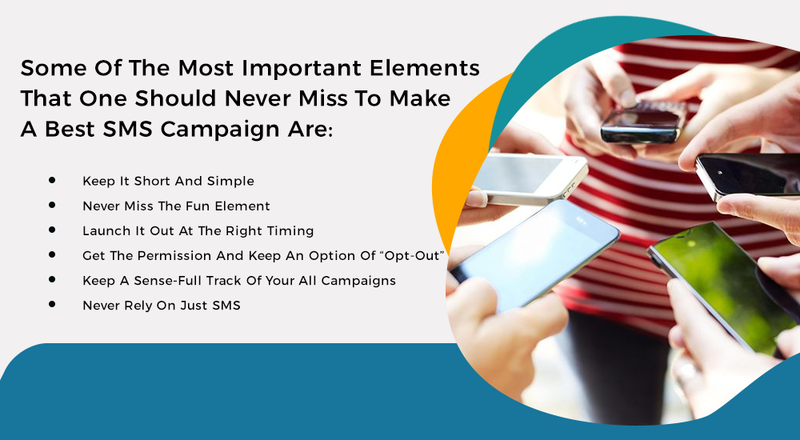 Last but not the least; never get fully dependent on just SMS campaigns. Use other mediums of advertising and promotion too along with it to experience better results.